COUNCILLOR Georgina Oxley has been voted in by her colleagues as mayor of Kingston Council. 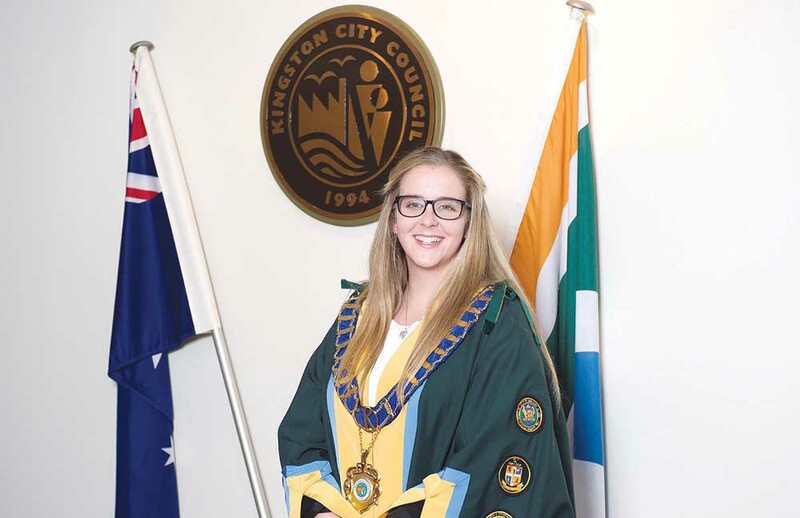 Cr Oxley was voted in as mayor at a 14 November council meeting. No others were nominated for the role, and she was elected unopposed. Mayors are elected for a one year term. Cr Oxley has taken over from outgoing mayor Cr Steve Staikos, who was elected as deputy mayor at the same meeting. Cr Tamara Barth nominated Cr Oxley for the role. The 23-year-old South Ward councillor is the youngest currently sitting on Kingston Council. She is serving her first term, having been elected in 2016. Cr Oxley outlined her priorities at the meeting, and said she was “incredibly humbled to be sitting in this chair”. “I thank my fellow councillors who have supported me with this incredible opportunity. Over the next 12 months my main priority is to continue to put the best interests of the residents of the City of Kingston first,” she said. “One of my biggest passions in life is giving a voice to people who do not or can not have a voice of their own. In developing Kingston’s prevention of family violence action plan, I was humbled by the support we have received from all walks of life within our community. I look forward to continuing working with the community to implement this plan and continue putting the issue of family violence at the front of people’s minds. “When it comes to gender equality I want to continue the great work that is already being done across Kingston and Victoria, equipping our local sports club with female friendly facilities. Cr Oxley noted there would be challenging issues during her upcoming term, such as decisions related to rate capping and planning zones. She said the council had achieved “fantastic things” and hoped that would continue for the next 12 months. North Ward councillor Steve Staikos was thanked by his fellow councillors as he departed the role. His election as deputy mayor of Kingston was also unopposed. Cr Oxley was the previous deputy mayor. Cr Barth commended his work with staff, councillors and the community. “It’s my pleasure on behalf of all the councillors here and away today to thank you for all of your hard work and energy and effort. It’s been as usual a pleasure to work alongside you. I continue to grow in admiration for you as I have seen you tackle each issue as it came with bravery, insight and intelligence,” she said. Cr David Eden congratulated the outgoing mayor on his “ability to open doors at a government level”. Cr Rosemary West thanked Cr Staikos for an “excellent” term as mayor. Cr Tamsin Bearsley said she “really appreciated” his dedication to the role. “North Ward residents are incredibly lucky to have such a dedicated representative such as yourself,” she said. Crs Geoff Gledhill and George Hua were absent. Cr Gledhill is currently campaigning as the Liberal candidate for the marginal Labor seat of Mordialloc.